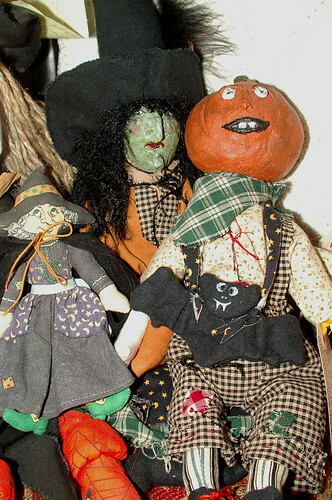 Over on ellominator blog there is a wal happening (wal = weave along). 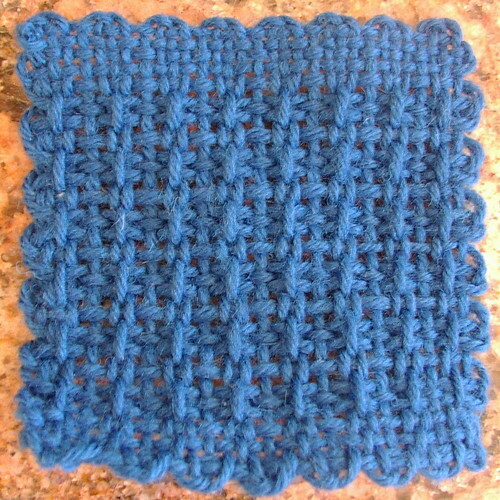 Week 1 is windowpane lace pattern. 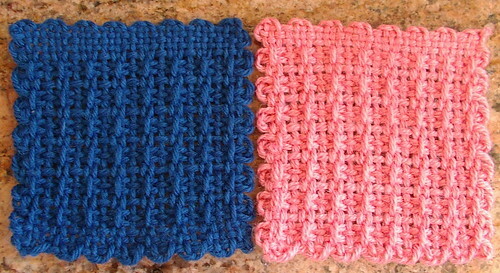 I did two: one in blue and one in pink. 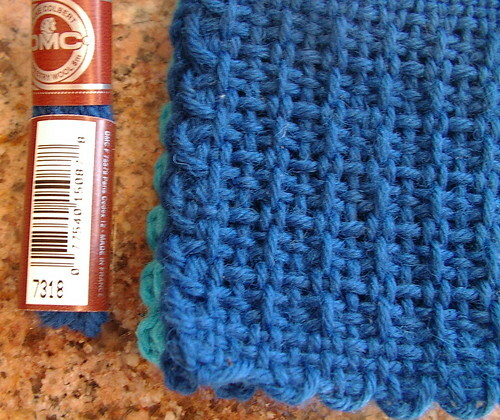 Both are Virgin wool; the blue is DMC tapestry wool color 7318, the pink wool one is Bucilla Persian needlepoint & crewel wool color was accidentally left of the wrapper so I don't know what color it is other than pink. 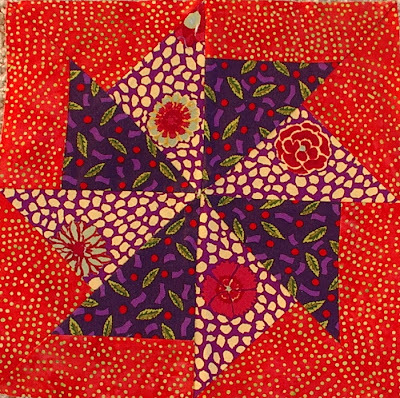 Suzyhomemaker over at MJF sent me a picture of what my quilt looks like on her kitchen wall. This is the photo she took. I like the color of her walls; it's very pretty. I hope she is doing well and that this cheers her up in fighting her cancer. 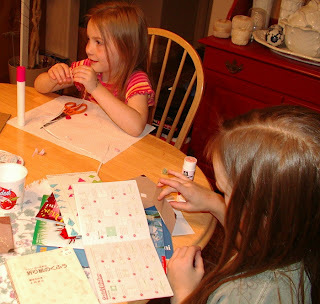 My kids are wanting to enter a Christmas Ornament /Decorated tree contest, so out came the crafts. 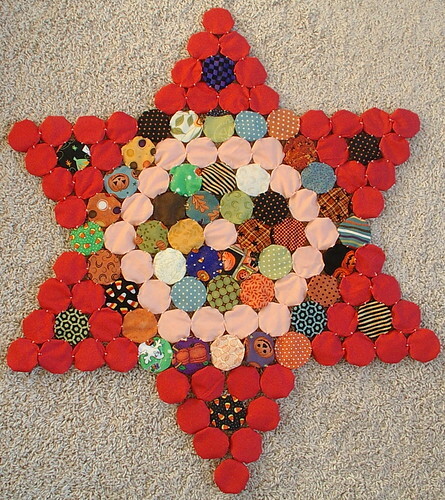 So far, two are making quilled ornaments and one is working on Origami ornaments. I think they are going to have a lot of fun with this project, and they have almost two months till the deadline. So I can guess there will probably be lots of glue out for the next few weeks. 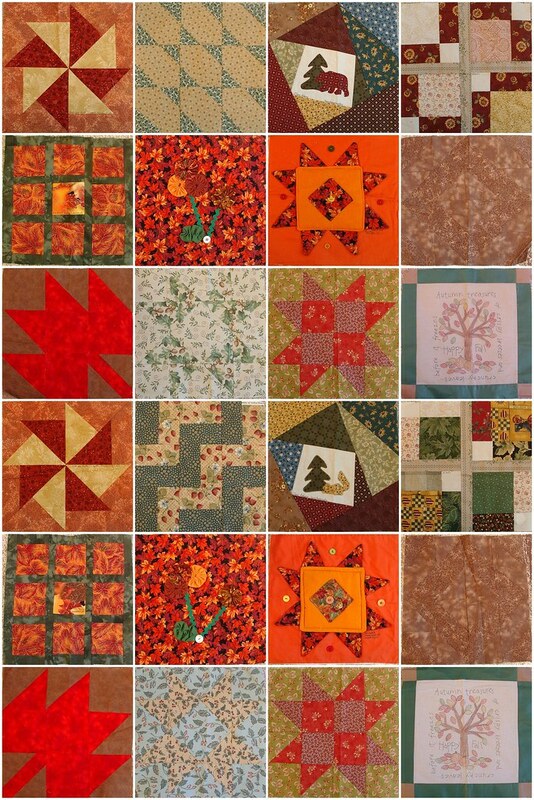 I have made a little bit of progress on the Halloween yoyo quilt. Here is what has become of the Halloween yoyo swap over at MJF. 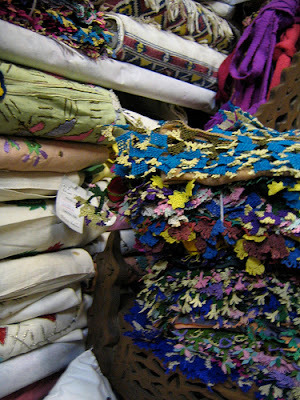 I have started to make a lap blanket out of them. This will have more yoyos than the amount I swapped because I have made a lot more since the swap. 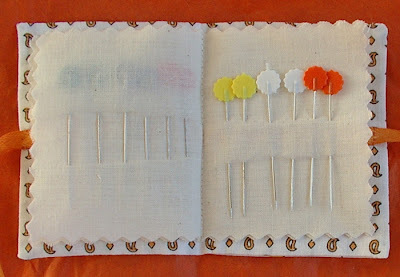 I still have about 300 cut to stitch to add to the ones I already have made. Not sure how big this will end up, nor what the pattern will end up looking like. I am planning it out as I go, as always. 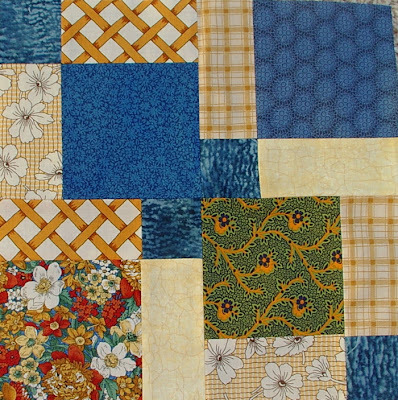 The photo above is of the back of the quilt because I am still stitching the bottom point on. 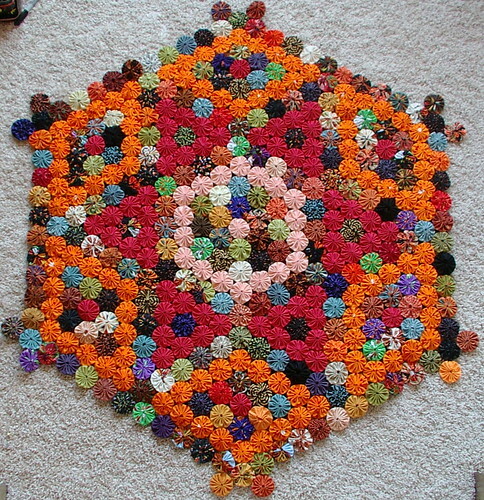 I work from the back of the project when I am adding yoyos to the blanket; it is easier for me. 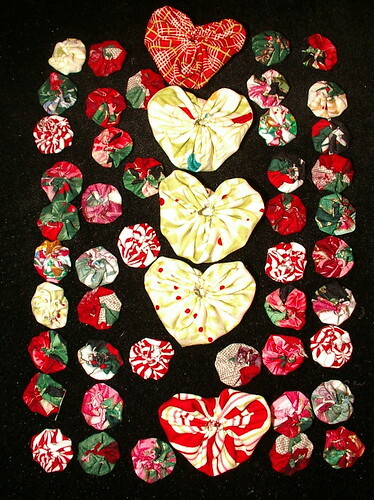 121 yoyos thus far on the quilt, about 300 more made, and 400 more cut. 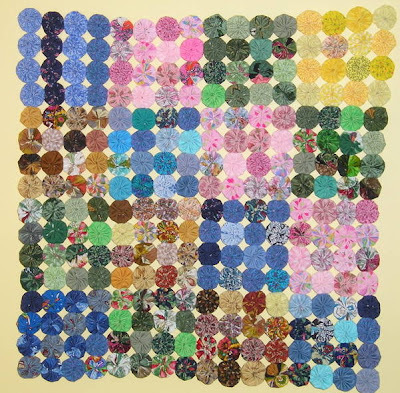 Front of quilt thus far, because it is still growing. If you want to do the "Journey" from last year, I thought I would post this now so people could plan to take the journey. Follow the link and read all posts and all extra instructions in the following links on the new pages. The hunt continues. 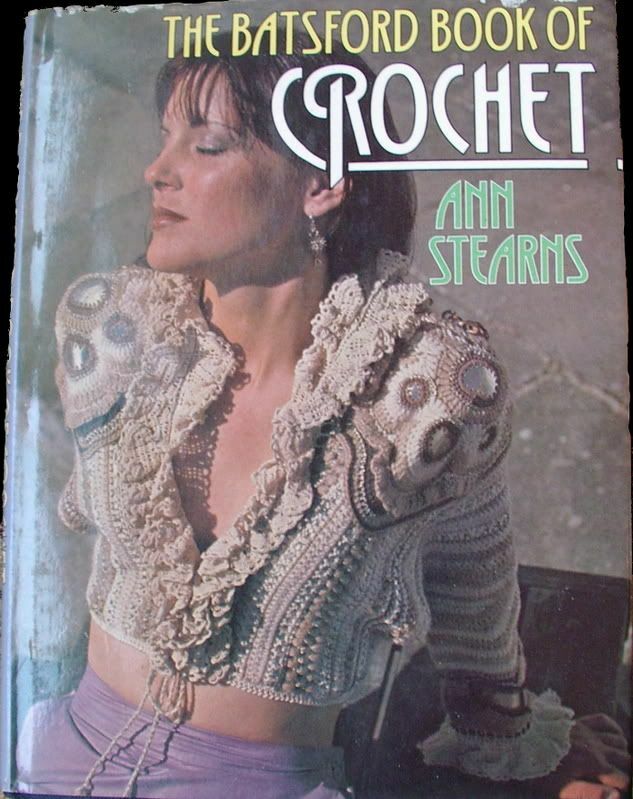 Here is another book I have on needle lace. 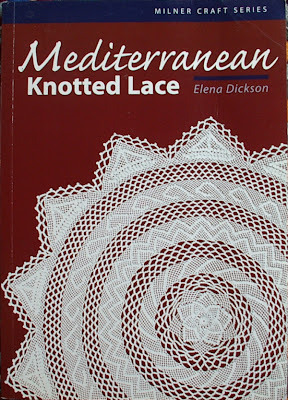 This is Mediterranean Knotted Lace By Elena Dickson isbn 1-86351-346-9. 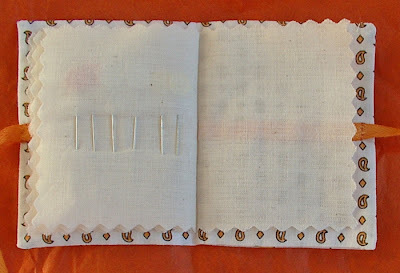 A lovely book, it shows how to do needle stitches, but it was intended to make doilies more than edgings. 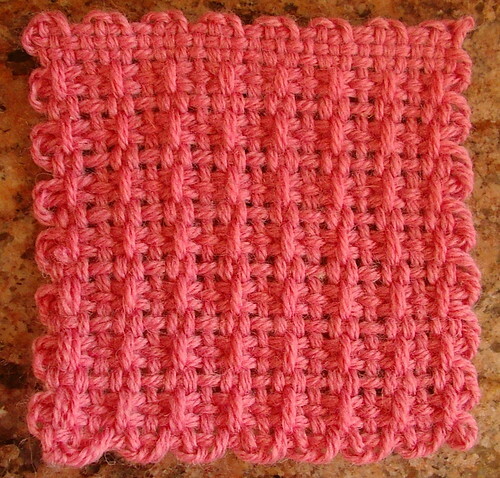 Yes, I can use the techniques, but I wanted to start off making the lace edgings I like so much. 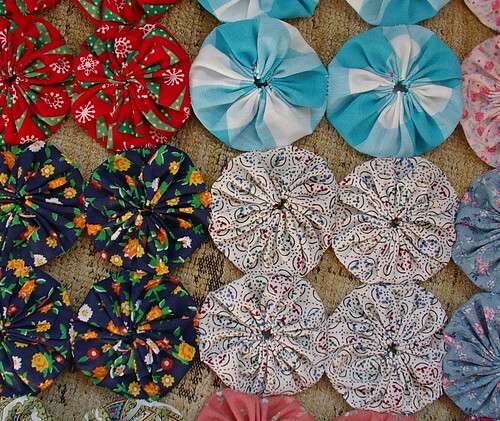 I am not interested in doilies so much, but the lace that dangles with decorative lace flowers that blow in a soft breeze -- that is the look I want. I know the books I want to buy, but they are out of my price range at the moment. Here is the next little bit of this challenge; it's not as big as the other items I have done. I really haven't had much time to work on this or the butterfly room as of late, so I combined the two. 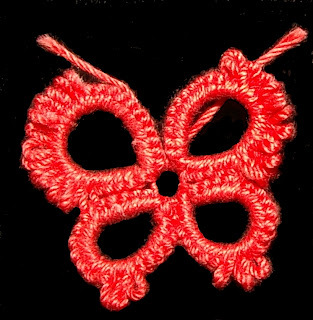 Here are two butterflies that I tatted out of antique size 10 crochet thread. These are actually the size of quarters; I just took my photo in macro mode so these look much bigger than they are. Together I will call them item 11 for the challenge. Still looking for lace patterns. 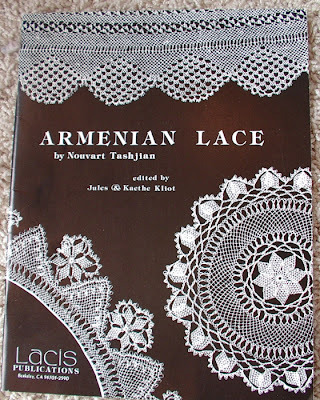 So I went looking through my books, and I already have these books on Armenian lace because I went looking a few years back on this subject, too. 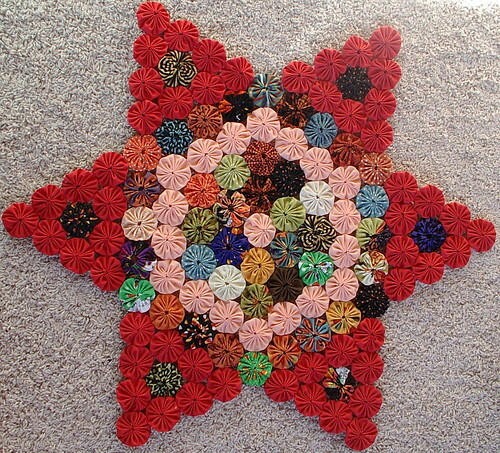 All mine are on the needle lace version of the lace; I am also looking for the beaded and crochet and tatted versions. I think I have a few more books around here, too, but I think they may still be boxed up. The top two I think are the same book; I can't find the top left one right now. I think they are just different editions and didn't realize that when I bought them. 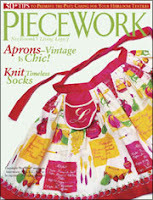 The PieceWork is the July / August 1996 edition. 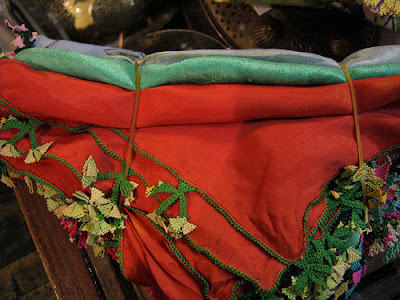 I think there is another PieceWork with this type of lace, or so I have been told. The nice person who said this is checking her books; if so, I may order that one too the more references the better. The middle left book I know I have, but it is one of those I can't find at the moment. 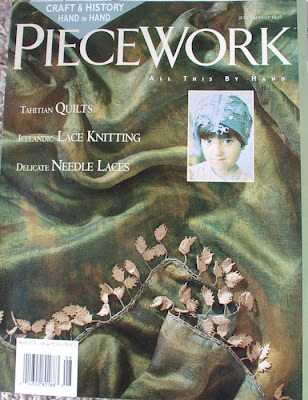 The bottom left book is the other PieceWork magazine that has this type of lace in it. 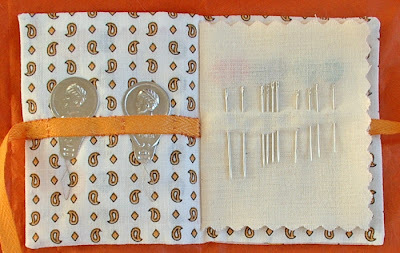 I am on a search for Turkish and Armenian Lace books. 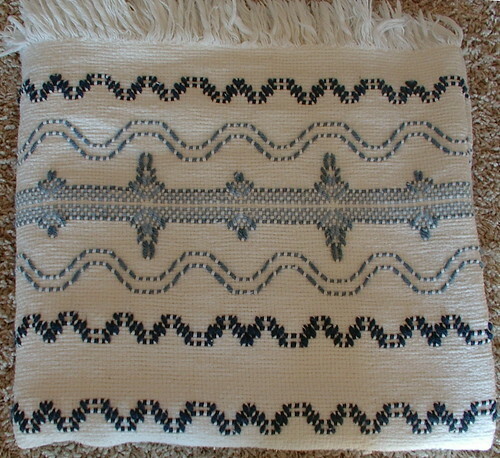 I am specifically looking for pattern books on Oya, Oyasi and Oyalari lace, sometimes called Bebilla lace in Greece. 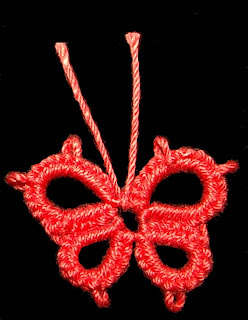 This can be beaded, crochet, knotted, or tatted patterns; it comes in all those styles, and I do make those types of laces. So if anyone can help me, I would appreciate it. 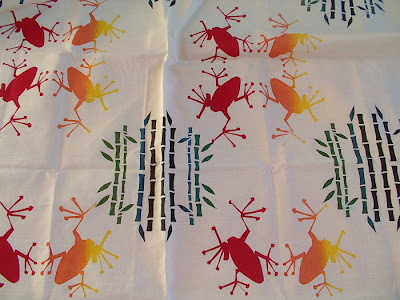 For all I know the page links I have given here may say how to get pattern books but, since I can't read that language, I do not know. Any help would be appreciated. 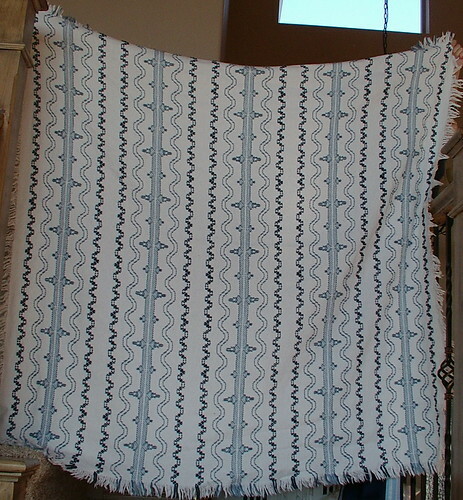 A long time back I showed the two Swedish weave blankets my Mother-in-law made for my oldest and youngest daughters. 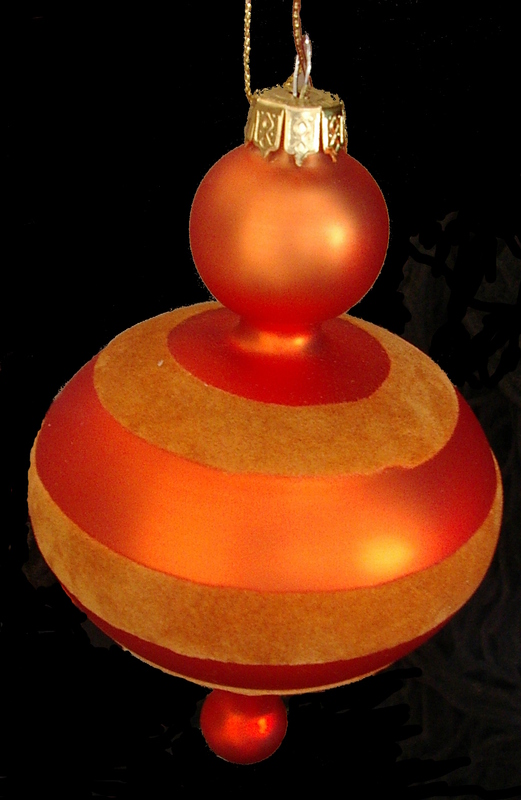 Over the summer she gave one to my middle daughter for her 8th birthday. I just realized I have never shown it. She sleeps with it every night so it may not be the cleanest in this photo, but we love it and she, my daughter, defiatly does. Some day I plan on making one for myself, but it hasn't happened yet. 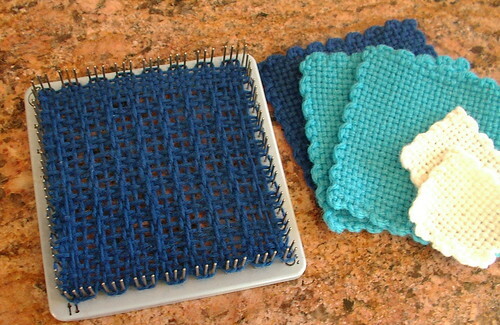 Incase you have never seen this type of weaving, you buy Monks cloth and weave into the weave of the cloth forming patterns with yarn. 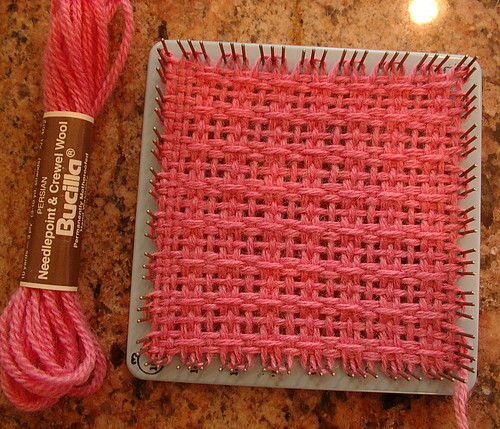 It is very similar to huck weaving, but that is done on a smaller weave for table cloths and things of that sort. ck/ my daughter's yoyos, originally uploaded by sunshine's creations. 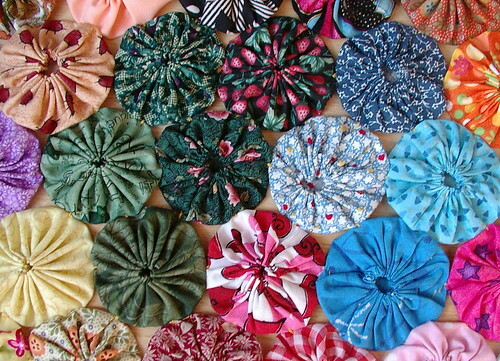 My daughter has made these for the swap we are in for Christmas yoyo's. 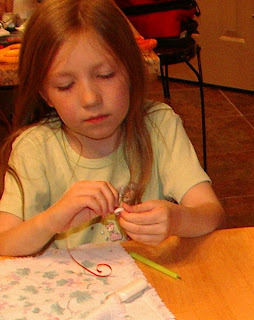 She is using a clover tool to make circles and hearts; the circle ones are the size of a USA dime. She is having fun, and I think she will go well beyond the fifty she is signed up for. 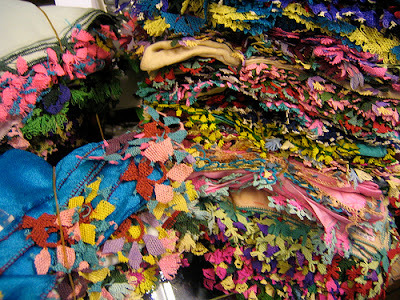 Currently our goal is to make a garland, but that may change. Just one of those things I will add to my list of wants, as if it wasn't long enough as is. 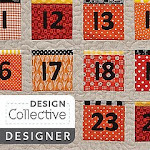 Have you checked out William Sonoma's Web site lately? 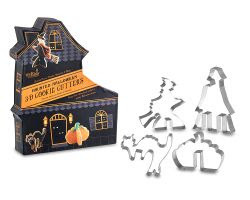 They have these cool stand up cookie cutters. They are on sale at the moment; I am so thinking of getting these but will hold off for awhile. 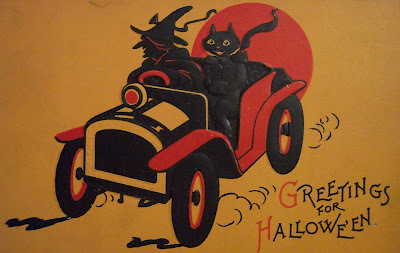 I have a kid who is born right around Halloween time, and she loves all things Halloween. I think this would be so cool to have for birthday party fun and such. 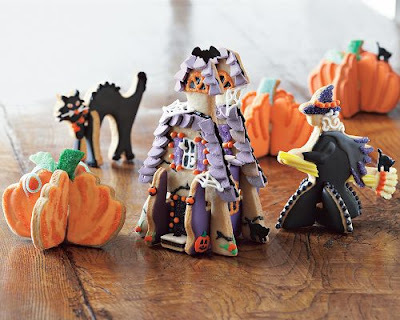 The photos in this post are not mine; they are from William Sonoma. I have made the pictures links. So, if you want to check them out or order them for yourself, just click on the photos. 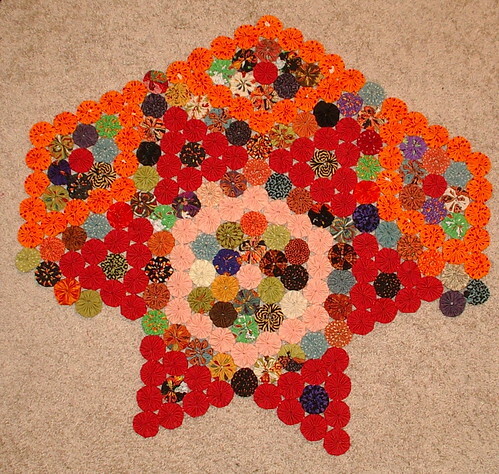 yoyo bench cover has grown, originally uploaded by sunshine's creations. This runner has grown by 10 rows. 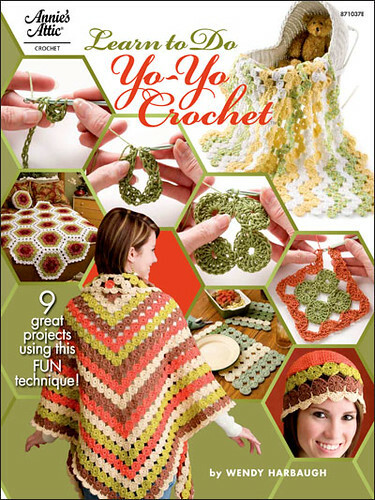 The nice thing about yoyo afghans is that you can use them while they grow bigger. In time, this will end up a table cover, then a sofa blanket, then a twin- bed blanket, and probably get all the way to King-bed size. 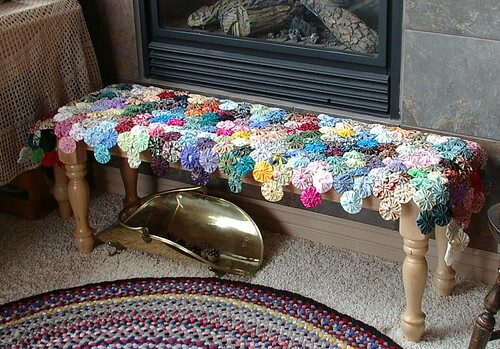 For now, it makes a lovely bench cover. 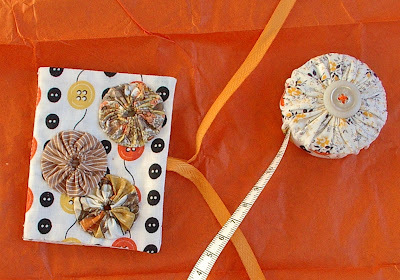 The template used for these yoyos is a standard size cd, if you care to make one. A lot of the yoyos in this runner I received as gifts from yoyo swaps. cinnamongirl, from whom I have four. 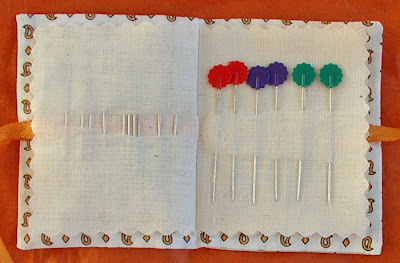 Sunshine (twice): Mine are not pictured; because I made them for everyone else but not myself, I made traditional nine patch. Because I signed up twice, I have two from every one except Cinnamongirl; I have 4 from her because she signed up twice, too. 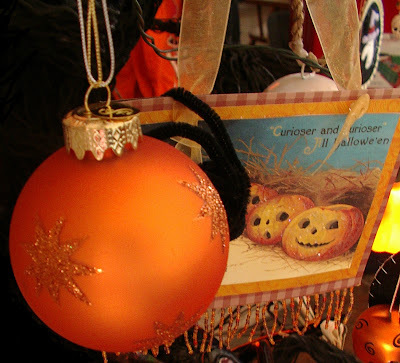 Here are two other blogs that I post on, in case you wanted to check them out. These two blogs are extreme opposites of each other, so be prepared for that. Peony, originally uploaded by sunshine's creations. If you belong to flickr and you have pink photos, add them to the Passionately Pink for the Cure group. I added 47 photos today I wish I had more, but since it is not my favorite color, that is more than I thought I would be able to add. I am looking for things pink to add this month. I am sure most of us know someone who has had this or will have this. 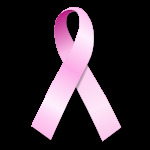 Prepare now to help your loved ones before you find out they have this; add as many pictures as you can in pink. This text taken from the text directly from the group I did not write it but thought it important to post. Nancy G. Brinker promised her dying sister, Susan G. Komen, that she would do everything in her power to end breast cancer forever. In 1982, that promise became Susan G. Komen for the Cure and launched the global breast cancer movement. Today, Komen for the Cure is the world's largest grassroots network of breast cancer survivors and activists fighting to save lives, empower people, ensure quality care for all and energize science to find the cures. Thanks to events like Passionately Pink for the Cure, they have invested nearly $1 billion to fulfill our promise, becoming the largest source of nonprofit funds dedicated to the fight against breast cancer in the world. Passionately Pink for the Cure is a grassroots fundraising and awareness program of Susan G. Komen for the Cure, the global leader in the breast cancer movement. What makes you passionate for the cure? Showcase your passion for the cure by uploading passionately pink photos to help raise vital funds for Susan G. Komen for the Cure. Share photos in honor of a survivor, in memory of a loved one, to celebrate Passionately Pink for the Cure events. 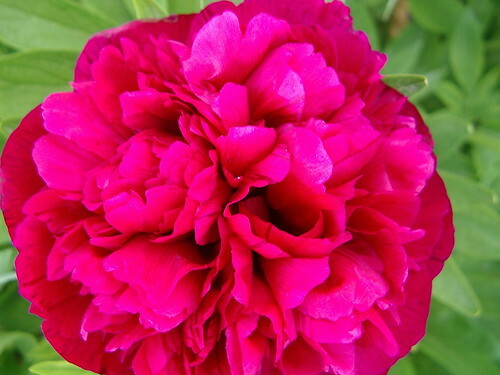 Or simply share a pink photo that inspires others to rally around the cause. Pick your Pink. Play Your Part. End Breast Cancer. "